Along with a refresh of the ThinkPad lineup, Lenovo is also offering several new accessories to compliment the new laptops. There are two new docks, and two new displays, each offering at a minimum USB-C connectivity to simplify connections. It’s great to see more Thunderbolt 3 docking solutions on the market. Thunderbolt 3 offers up to 40 Gbps full duplex, which gives a lot more options for IO than ever before. 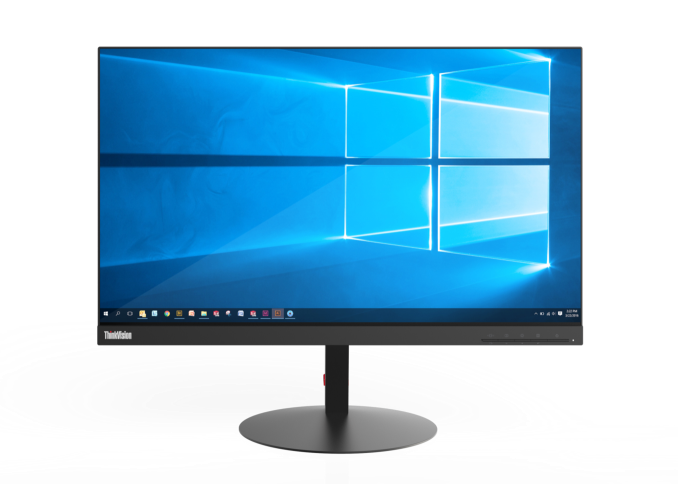 It can natively support two DisplayPort 1.2 streams, for up to two UHD displays at 60 Hz each, and because it’s done over USB-C, it can leverage the 100 Watts of power delivery from that port. 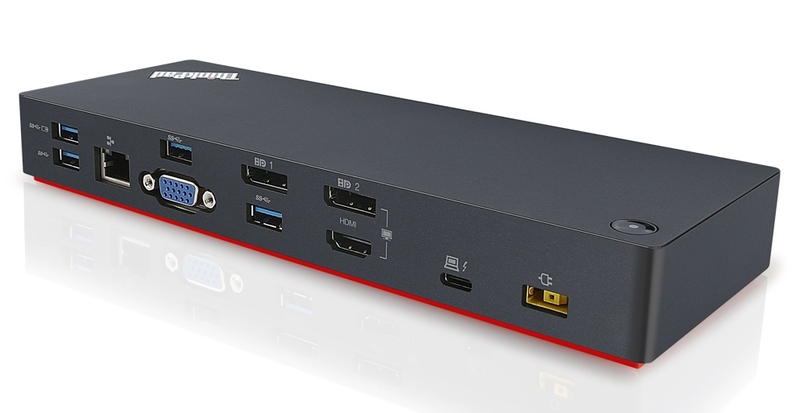 Since the ThinkPad Thunderbolt 3 dock is meant for business uers, some of the port selections may seem odd, but are still required by many organizations. The Thunderbolt 3 dock offers two DisplayPort ports, HDMI, VGA, five USB 3.0 ports with one of these always powered, Gigabit Ethernet, headset jack, and a Thunderbolt 3 port over USB-C, meaning you won’t lose your USB-C port when docking with this. The dock ships with a 135-Watt AC Adapter, which provides up to 65W of power to the laptop, and the remainder for powering the accessories. There is also a power button on the dock to control the ThinkPad power state when docked, which is nice since the laptop could easily be closed when docked. As far as display outputs, this dock will drive up to three UHD displays, but in that scenario only one will be at 60 Hz, since both of the DisplayPort outputs are from a single DP 1.2 stream. The third display would be driven off the Thunderbolt 3 output. It can drive two UHD displays at 60 Hz though, which is a much more likely scenario anyway. The Gigabit Ethernet port also supports PXE boot and Wake-On-LAN for select ThinkPad systems. 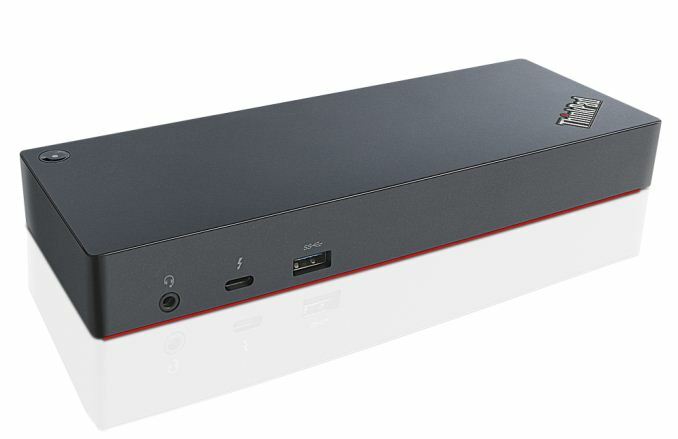 The ThinkPad Thunderbolt 3 Dock will be available in February for $279.99. If your laptop has USB-C Gen 2, but not Thunderbolt 3, then this dock offers a subset of the Thunderbolt 3 versions features, due to the more limited bandwidth of USB 3.1 Gen 2. It still offers two DisplayPort outputs, along with VGA, and 3 USB 3.0 ports, 2 USB 2.0 ports, 1 USB Type-C port, Gigabit Ethernet, and a headset jack. This dock ships with a 90-Watt AC Adapter, offering up to 60W of power to charge the laptop. The display options are much more limited than the Thunderbolt 3 option due to the limited bandwidth. A single UHD display can be driven but only at 30 Hz, or dual 1920x1080 displays at 60 Hz. The Gigabit Ethernet port still offers PXE boot and Wake-On-LAN support for select ThinkPad systems. 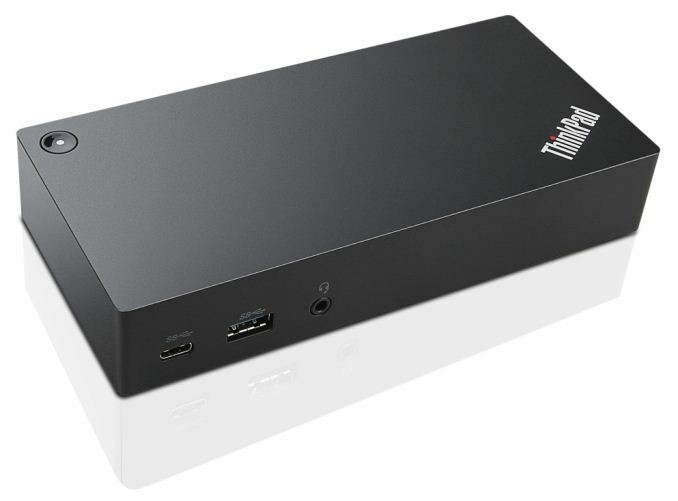 The ThinkPad USB-C Dock will be available in January for $199.99. Lenovo is also launching two new ThinkVision displays, which offer the same features in either a 23.8-inch or 27-inch model. 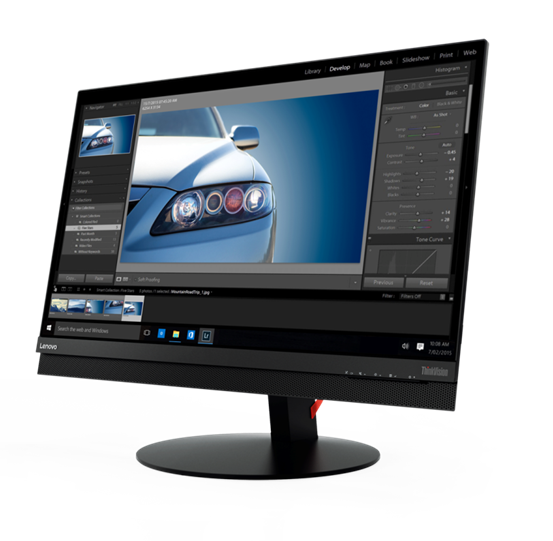 These thin bezel IPS displays both offer QHD (2560x1440) resolution and factory-calibrated sRGB color gamut. Whether this means per-panel or per-batch is unknown, but it’s good to see a focus on improved color accuracy rather than just quoting gamut coverage values. Both displays offer two HDMI inputs, DisplayPort input, DisplayPort output for daisychaining, and a USB-C offering for a single cable connection. There are also five USB 3.0 ports, with four down and one up, with the USB now on the edge of the display for easier access. 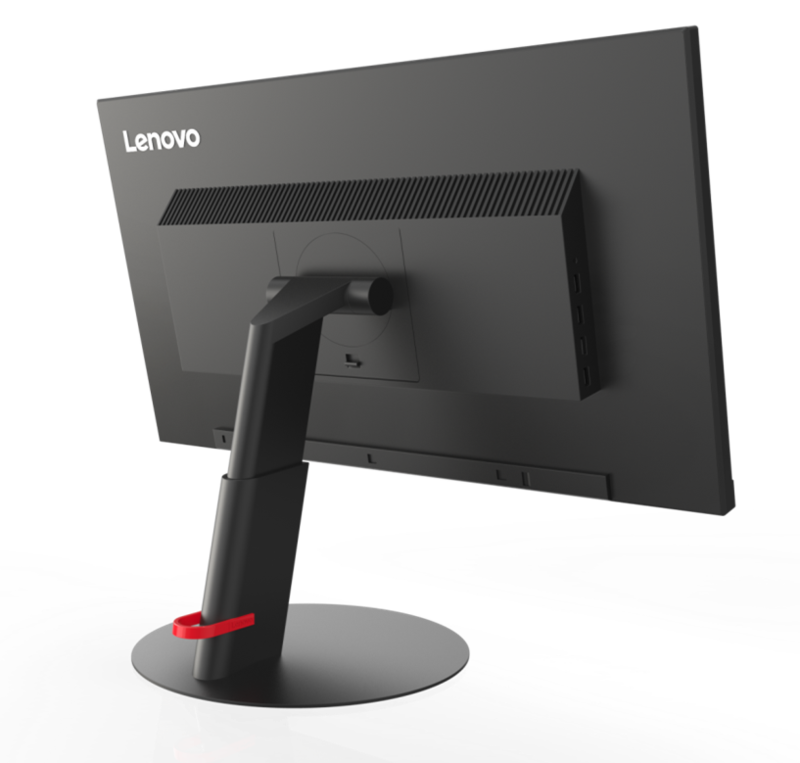 The stand features adjustable height, tilt, swivel, and pivot of plus or minus 90° and there is a ThinkCenter TINY desktop connector as well. With the USB-C option, and four USB 3.0 ports, the display could be easily used as a single cable docking solution, and the display will offer up to 45W of power delivery to charge a laptop. Both of these displays will be available in March 2017, with the P24h priced at $259 and the P27h priced at $329. Can we have a dock with 2x DP; each on it's own stream? It's impossble to connect 2x 4k@60hz monitors without extra converters/dongles. So both docks use the same connector.